Early Modern Interpretations of the Prophet & Old Testament Prophecy, by G. Sujin Pak. Protestant reformers found the prophet and biblical prophecy to be exceptionally effective for framing their reforming work under the authority of Scripturefor the true prophet speaks the Word of God alone and calls the people, their worship, and their beliefs and practices back to the Word of God. 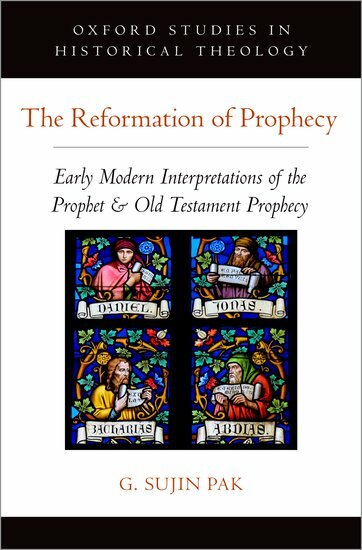 The Reformation of Prophecy uses the prophet and biblical prophecy as a powerful lens through which to view many aspects of the reformers in the sixteenth and seventeenth centuries. G. Sujin Pak argues that these prophetic concepts served the substantial purposes of articulating a theology of the priesthood of all believers, a biblical model of the pastoral office, a biblical vision of the reform of worship, and biblical processes for discerning right interpretation of Scripture. Pak demonstrates the ways in which understandings of the prophet and biblical prophecy contributed to the formation of distinct confessional identities. She goes on to demonstrate the waning of explicit prophetic terminology, particularly among the next generation of Protestant leadership. Eventually, she shows, the Protestant reformers concluded that the figure of the prophet carried with it as many problems as it did benefits, though they continued to give much time and attention to the exegesis of biblical prophetic writings.